The second and third are 3D covers. Unfortunately, you can’t actually use a cover like this in any ebook store, but they look very good for marketing purposes. (3D covers of book bundles are, however, often accepted.) If you would like to learn how to create a 3D cover, check out this article. And finally, the fourth. This is what an ebook cover should like. It has to be flat, in a portrait format, and readable in a thumbnail size. We don’t want to go all professional on you, but it doesn’t hurt to know what resolution means before having a go at creating your own ebook cover. We cover cover sizes in great detail here, but let’s just have a quick recap for those of you who don’t want to click. We recommend a size of 1600✕2400 pixels: this is large enough to display well on all kinds of devices (even if you are shopping from your computer and are clicking to enlarge cover), but you can easily embed it in your epub. (Please note that you don’t have to embed your cover when uploading to Amazon, but you’ll have to embed your cover when uploading anywhere else.) Embedded covers can’t be over 4 megapixels for iBooks, but we actually recommend that the shorter side is not more than 800 pixels long. This would be large enough to display well on a tablet, but doesn’t increase file size unnecessarily. Your embedded and separately uploaded cover should be the same, but you can use two different sizes of the same cover: a large resolution one to upload separately, and a smaller one to embed in the book. To make sure that your cover will be accepted by the stores, check out this detailed list of cover image requirements. Whether you decide to hire a designer or create your book cover yourself, there are certain things you have to decide in advance to avoid disappointment later. 1) Check covers in your genre on Amazon, preferably the bestseller list. This is the most important step: you want readers to immediately know what they can expect. If you see covers like this, it is immediately clear that these are billionaire romances. You don’t even have to be able to read the title! They all use the same imagery: dark background, dark haired man in suit or shirt, looking in the camera or just away from the camera. The same goes for all genre fiction. It is enough to look at these covers in thumbnail size to know that these are fantasy. The fonts (serif, with nice touches on some of the consonants), the colours (turquoise and gold), and the ‘fairy dust’ make the genre obvious at first sight. Creating a book cover that is not in line with genre standards will result in unhappy readers who didn’t get what they expected. 2) Have a general idea of what you are looking for. Start collecting book covers you like (and save them on Pinterest or to a folder on your computer). Start taking notes. There are many little things that can decide whether you like a cover or not. For example, some authors (and readers) prefer if the face of the lead character is not shown on the cover – more space for imagination. Others find their ideal model and roll with it. 3) Decide on your budget. While nobody likes talking about money, publishing a book is an investment, and self-publishing is an investment you have to make. You can, of course, get a good cover for free, but if your aesthetic skills are like mine, it is definitely worth paying for. The cover should catch the eye of your potential reader and shout: “Read me! Read me!” I don’t have any faith in my design abilities, so I would certainly pay a professional, would it ever come to that – if I would be able to afford it. But if this is your first book, it is likely that you’ll have to go for a budget book cover, and try getting the most out of it. Well, at least this is straightforward, isn’t it? If you need help on selecting a good pen name or giving a title that really sells, check out this article. Before you start designing, let’s see what to put and not to put on a book cover. Regular readers of this blog might have noticed how much I love do and don’t lists. Continuing a steady tradition, please do put on the cover your name, your title and your subtitle (with smaller case). You might also put the series name or volume on the cover, but if your covers look visually similar, it is not necessary: entirely up to you. If you won a prize, reached no. 1 on Amazon in a category or sold over a million copies, you can also put that on the cover. Subtle, short quotes from your reviews are also allowed. Please don’t put on your cover any price references (neither ebook nor paperback) or keywords. Prices simply change too fast! And definitely don’t overstuff your cover. The less is often the better. Most other genres, however, require a photo in the background. But how to get one? If you can’t afford to pay an artist or a photographer, you’ll have to use a free stock photo. There are many collections of free or cheap stock photos online. What is stock photography? A stock photo is a photo that can be licensed by many different companies and used for many different purposes. And it is used for all kinds of things! For some insight on how wide the usability of stock photos is, check this article. If you decide to use or buy a stock photo, it is likely that other covers in your genre will have the same photo, or even: you can see your beloved main character on a billboard, advertising a toothpaste – or something much worse. See the following stock photo on four covers and two ads. If you decide to use a stock photo, you can easily find a free or very cheap (under 10 USD) one. Never use a stock photo without purchasing the commercial rights. You’ll need to make sure that the image is free to use and modify for commercial purposes. If your photo has watermarks, or if it is not available in a format large enough, you are likely not using it legally. Other option is to look for a photo that is licensed in the Creative Commons system. Creative commons is a system developed for easy copyright management online. If you get your picture from a website that supports creative commons, you don’t have to do a long research to learn what you can do with the picture. The little pictograms clearly tell you your rights. For a book cover, you’d need something with commercial rights (without the crossed out dollar sign) and with right to make modifications (without the equation mark). Remember to credit the author of the photo on your copyright page or in your colophon. Don’t forget to credit the photographer if it is required. You can give credits on the copyright page. We already wrote an awfully lot about book cover fonts for different genres, so I won’t waste any screen space here. If you’re using an online app to edit your book cover, you most likely won’t be able to upload your own font, but you can still use these guidelines to choose the best from the ones at your disposal. Once you have your title, suitable cover art and font ready, it is time to put everything together! Paint comes pre-installed to all Windows computers. It is definitely not a professional photo editor, but it can be used to create a simple cover photo. Its greatest disadvantage is that you can’t easily change things: it can’t handle separate layers. Once you’ve entered your text, for example, you can’t easily move it around or change it. We don’t recommend it. Gimp is an open source image editor. It is a lot like PhotoShop, but free. It can be installed on Windows, OS X and Linux based computers. While the software takes some getting used to, it is perfect for all your image manipulation, editing and creating needs. If you have a stock photo and a suitable font, you can use Gimp to combine them. If you are working from a smartphone or a tablet and downloading a desktop software is not something you can afford to do, try a free online cover designer app. 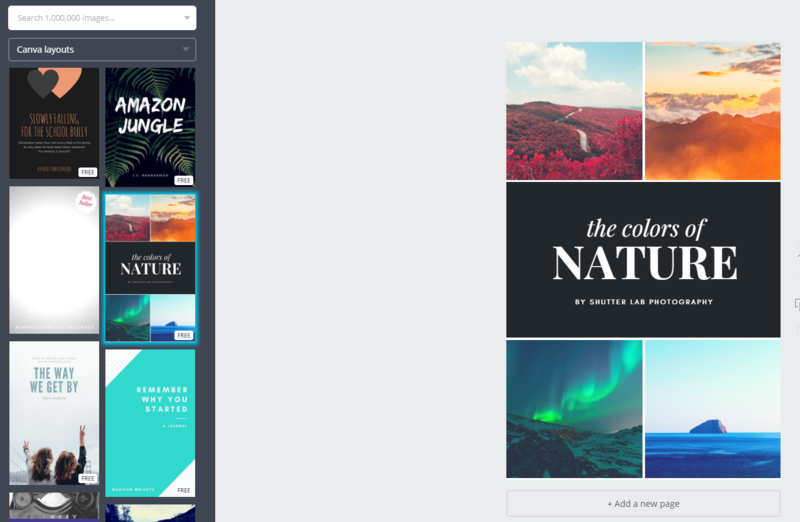 Our team has two favourites: Spark and Canva. We have compared their features in length in another article. They are both free, both have an amazing collection of stock photos, and both let you upload your own picture as well. 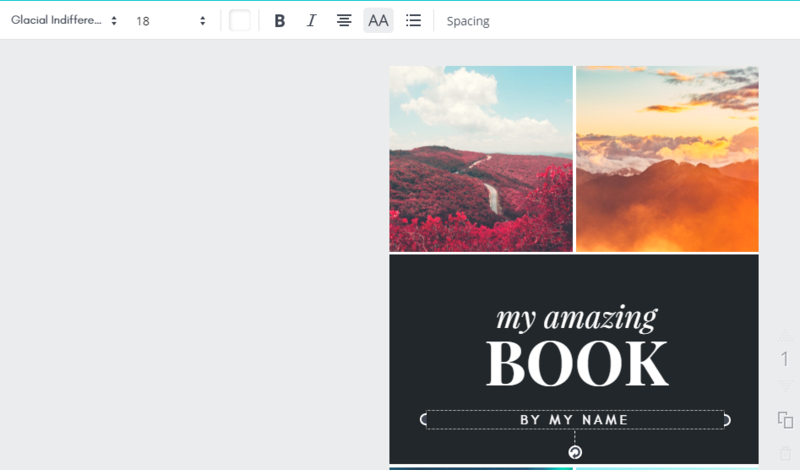 You can use Canva as your ebook cover maker or Wattpad cover maker. Once you have everything ready, it is time to put everything you’ve learned into action. Go to Canva.com, and sign up or log in. 1. Click the green “Create a design” button. Scroll down until you see “Blogging & eBooks”. Select “Book cover” or “Wattpad Book cover”. 2. You can start with a blank page, or select a layout from the left for inspiration. If you are an inexperienced designer, we recommend selecting a layout. You can change everything later. There are both free and paid layouts to choose from. 3. Click on any text to change it. Enter your title and name. You can also change the font, the size and the color of your title and name. 4. Now is the time to make your ebook cover truly yours! On the left, type in your search word and select “Photos”. You’ll be provided with a great selection of free or cheap stock photos. 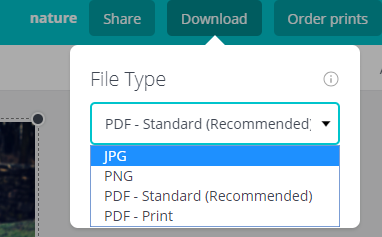 Alternatively, you can upload pictures from your computer. 5. Drag and drop your picture to the spot where you want it. It’ll replace the photo that is already there. 6. To change the photo (eg. resize or move it), simply double click it. To flip it or add filters, a single click is enough, and you can choose an action from the top. 7. That’s it! Just make sure to download the cover as a JPG file. Great, your cover is ready! You can upload it to the bookstores, but for best results: show it to somebody first! I have very little visual taste, so whatever I create I believe it to be beautiful. (And my amazing colleagues never say otherwise because they don’t want to hurt my feelings.) But it is normal: nobody is able to look at a piece of art (or a piece of writing) with the eyes of an outsider. Your cover, whether you made it yourself or hired a designer, is like your baby. And, while all babies are perfect, not all covers are. Before you put your cover out there, you have to get some honest feedback on it. Not from your mum, not for your best friend, but somebody who is in your target group: somebody who could potentially spot your book in a book store, pick it up, buy it and read it. But where to find the right people to give feedback on your book cover? My favourite book cover feedback group is the Indie Cover Project. It is full with amazing people who check your cover, read your blurb and tell you what to change. The advice they give is usually very thorough and professional: they tell you whether your cover is in line with genre standards, whether you’re targeting the right age group, whether your title is readable enough etc. We hope that by now you know how to create a book cover for free. Did we miss something important? Let us know in the comments.